We just found this great company called Growth Factor. They make a great dietary supplement that includes great nutrients to help strengthen and build lean muscle. It includes amino acid blends that aide in the healthy development of muscles. This great amino acid blend lays a great foundation for the growth and development of strong and healthy muscles. The best part is that the nutrients used in Growth Factor are completely healthy and safe to use. Completely free of negative stimulants. Another great thing about Growth Factor is that is aids in weight loss. It helps to build healthy muscle and aides in the recovery process during and after workouts. This builds a healthy environment in our bodies to aid in healthy weigh loss. Lose fat and gain lean muscle! 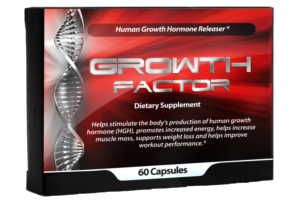 We just tried out this great new dietary supplement from Growth Factor. This is a great supplement. It helps to promote the growth of lean muscle mass and reduce weight. I got this for my husband who has been working out a lot lately. He has been taking this and he finds that it helps to make him feel better during the day, he has more energy, and it has improved his results from working out when it comes to weight loss. Great product! The box comes with 60 capsules. They are good sized pills, not to large. I hate taking supplements when they are giant. They are gel caps so easy to swallow and take. It was very easy to incorporate these into his current daily routine. He has been very happy with the results as well. They are a great addition to a healthy lifestyle. It’s a great supplement that aids in the healthy development of muscle growth and development. Highly recommend if you are looking to develop more lean muscle and develop a healthier lifestyle. You can find out more on this great website!